Design of a new 90 ft clear span, Avionics facility that serves B-1B and E-8C avionics and electronic countermeasures systems. The 22,700 SF facility is a 1-story metal building with a standing seam roof, CMU walls, brick veneer, and glazing designed for ATFP loads. The facility includes a large production area with secured storage and a sally port receiving area with overhead monorail cranes. 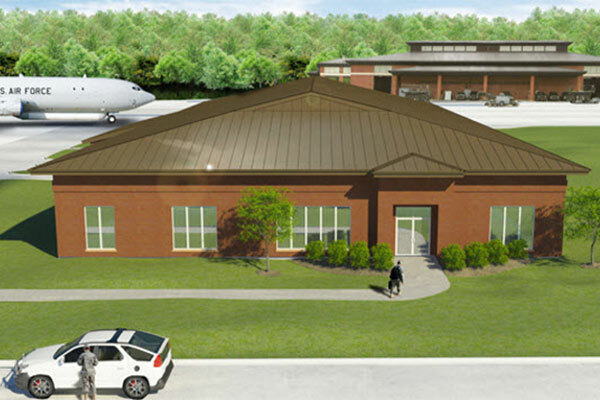 The new Avionics Facility for 116th Air Control Wing is a $5.25 million dollar facility that is located in the J-STARS area of Robins Air Force Base, GA. This was a design-build project which included demolition of an existing hangar and new construct for an Avionics facility on the site of demolished hangar. 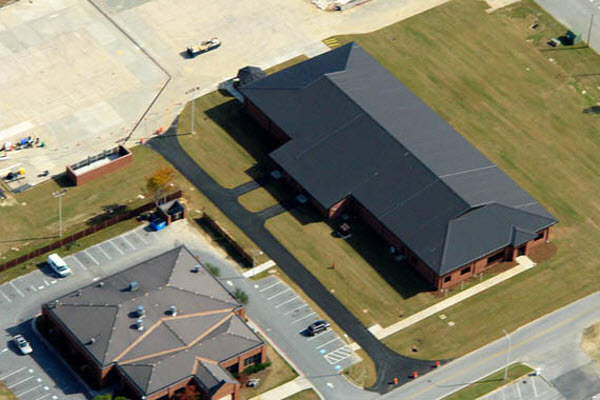 This new building is a maintenance and repair facility for US Air Force Avionics equipment. The building is a single story prefabricated metal building with a standing seam metal roof and non load bearing CMU walls with brick veneer. The interior consist of administrative office space, training rooms, conference room, rest room and shower facilities, and mechanical, electrical, and communications rooms. The majority of the facility is a production area with secured open storage room requiring secret clearance. The facility also includes a sally port type shipping and receiving area complete with overhead monorail hoists for loading and unloading. Site work included rework and expansion of existing parking areas, and bringing new power, fiber communications, CATV, sanitary, and chilled water supply and return to the new building location. Innovative Engineering Inc. (IEI) provided the structural design for the new 90 FT clear span 22,700 SF avionics facility with metal building framing, brick veneer, concrete masonry walls, monorail hoist and a hip shape structural standing seam metal roof. IEI provided structural design for masonry walls, slab-on-grade and foundations, and glazing blast design to meet ATFP standards. The project included a state-of-the-art slab-on-grade mix and joint design. Metal building reactions independently determined. Project was LEED Silver Certified; Applicable codes include: USACE Design Manual, DoD ATFP, NIBS, NCS, IBC, ACI and AISC. Software utilized: SPECSINTACT, DrChecks, AutoCAD, MathCAD, ENERCALC, and RAM.